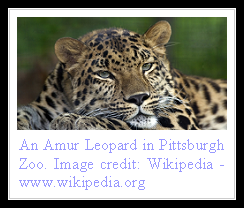 The rare Amur or Siberian Leopards are amongst the most endangered cats in the whole world. Nearly forty individuals exist in an area encompassing parts of Southeastern Russia, Northeastern China and North Korea, overlapping the range of Siberian Tiger. In this remote and unforgiving wilderness the beautiful cats face a multitude of threats, the most serious of them being poaching and loss of habitat. It is believed that poachers interested in the leopard's beautiful fur were responsible for the initial downfall of this subspecies, with numbers plummeting to around thirty individuals some time ago - the minimum required to maintain enough genetic biodiversity for a species' survival. Today the numbers are back to around forty, with thirty animals being in Russia, ten in China and a small population in North Korea. Still it is believed that if poachers kill two or three more females, it may be impossible to maintain a viable population of the big cat in the wild. Amur Leopards face other threats too. Their habitat is next to sites of some industrial megaprojects - pipelines of oil and natural gas that are proposed to pass through their territory. Recently through tireless efforts of environmental activists and political intervention, the oil pipeline was diverted. But the gas pipeline is still planned to go through their reserve - Kedrovaya Pad - the oldest national park in Russia. Then there is also the plan to construct a major highway through the park that will certainly disrupt the ecosystem of the great cats' habitat. This is a very interesting post and what a beautiful leopard. Such vanishingly small numbers - I do hope enough can be done to save them. Poachers are such scum. I'm glad I'm not the only one who thinks there is life and vibrancy in everything. Perhaps I'm not comletely bonkers after all! What a wonderful post about the odds this beautiful creature is up against. Education is the key in many of these animals receiving the protection and help that they need and with only 40 left, it's certainly important to help these gorgeous leopards. This is a very nice blog.I like that you have so much information on beautiful cats. I love cats and i have two of my own...Great blog. Keep up the good work! Ivey Case Solutions Solution and Analysis, Ivey Case Solutions Solutions, Custom solved according to your need. Thank you for sharing the post! It's nice to see information about all the species here. Great material, I have been looking for such great stuff for my paper work and remedy papers. Great article, I appreciate that you have shared it with everyone!